Imagine packing your bags for a 4-6 month adventure (or even longer) on a luxurious cruise ship, stopping at some of the world’s most beautiful and interesting destinations, dining on delectable cuisine and having a skilled, friendly crew at your service to ensure your trip goes off without a hitch. 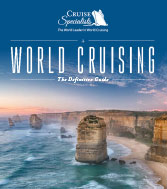 Those are just a few of the characteristics of a World Cruise. This is your guide to finding out why a World Cruise is the ultimate travel experience. Get your free copy from Cruise Specialists now.